An embarassment of riches! I know many of the poets whose poems are in this volume including me! So many I couldn’t possibly ask them all for permission to highlight their poems here! So I asked just a few. But I didn’t expect all the enthusiastic responses! So I am going to profile just three of the poems here and beg forgiveness for those I have missed. My choices say nothing about the quality of the poems not included. I almost decided to ditch the post to avoid misunderstandings but that would be unfair to this strong anthology! I hope to include some other poems in future blogs! An unusual aspect of this book is the range of the poets it features. It includes many well known Canadians such as Patrick Lane, Lorna Crozier, Jan Zwicky, John Barton, Derk Wynand, Wendy Morton, Brian Brett, Susan McCaslin, Pamela Porter and Sheri-D Wilson amd former Washington State Poet Laureate Sam Green and his wife Sally. But it also showcases many other fine poets who are not household names but whose poems don’t feel in any way out of place with those of their better-known counterparts. This blend of voices creates the secret sauce that makes this volume so easy to digest. Here’s a first taste of the fine poems in this collection: an uncharacteristically short poem! by Linda Thompson from Port Alberni, here on the island. I picked this because of Linda’s strong sense of place. She originally hails from the Pemberton area in B.C . This landscape is her blood and bones! And I couldn’t resist the wonderful sound of Lillooet. The five o’clock sun on the canal. that cuts through the Glover ranch. Soft grey silt from the Lillooet. It will be a long time dark. Bring your own light to the grave. Linda K. Thompson, with permission. What an anthology! And what a reading series. Planet Earth Poetry in one form or another (and in different venues) has been a Friday night fixture in Victoria for years. But since 2006 it’s been ensconced in the Hillside location but with a change of owners in 2010 the name was changed to The Moca House! Wendy Morton, a poetry impresario if there ever was one ran the series for ten years and since 2010 its Artistic Director has been Yvonne Blomer who has kept the series thriving! Yes! Here on Canada’s west (and sometimes wet!) coast there is a vibrant poetry scene! And no where is that better reflected than in the new anthology. One hundred and sixteen poets, and not just from Vancouver Island or the B.C. mainland but poets from all over North America who have preformed at Planet Earth. As Patrick Lane, the renowned Canadian poet, reminds us in his introduction, the eponymous Planet Earth Poetry is named after the title of one of the best known poems written by the Canadian poet P.K. Page ( 1916 -2010). Lane and many others consider her one of our great Canadian poets. And Planet Earth not only is a great poem but it’s also an out-of-this-world great poem! It’s a passenger in a satellite moving through outer space! There are many things that make this anthology special. The poems, obviously. But more; the way the editors Yvonne and Cynthia, have ordered the poems by theme and the way each thematic section has its own forward. What a lovely way to pace the book but also to help us enter into each section. Next, here is a poem by Vancouver Island writer David Fraser who is from Naniamo where he runs the WordStorm Poetry series and publishes the journal, Ascent Aspirations. David was one of the twenty five readers last Friday. all day chasing grumpy sheep. through the muck of runoff. It flows into the glen. born to the obsession of their craft. They know the present only. Not the baggage of this history. There are muddy hooves that jut into the air. Sheep in rotting piles. A stench. There are men and women torn and numb. raise their heads above the crags. Steady. Steady. Not like revenge. moving in a mass toward their pens. The dog’s tongues flop from their mouths. Eyes alert. Just a stare to move the herd. The dogs know not the moments of betrayal. a job well done, some food. where they can watch their sheep. When I heard David read on Friday I so appreciated how he comes at a difficult subject on a slant. This is always the trick with a poem of protest or outrage. How to avoid writing a position paper, as the poet Stephen Dunn says. How to write a poem that takes the reader by surprise, doesn’t clobber him or her with the self-rightous obvious? Fraser’s use of the dogs as a way into the harder, harsher story accomplishes this. Barbara Black is poet from Victoria. I choose her poem partly because it’s a prose poem but mainly because of its wonderful-crazy energy. And because she so re-creates the “isness” of the scene. The American poet B.H. (Pete) Fairchild says the creation of that “isness” is a major feature of a good poem. And I so appreciate seeing that “isness” created inside a prose poem! Us Larocque girls ran the other way when we saw Granny Larocque stomping out the back, screen door whacking the house like a punishment, her eyes two pie slits, huge bosom a hot broiling oven, apron strings flailing at her hips like the arms of drowners and did she yell? no, did she swear? well, yes, she said goddamhimgodalmightysonofa and the ground shrunk away from her feet, chickens started squawking crazy, and Gramp’s favourite Miss Pinkham blasted into the coop like she was walloped by a wind storm, hunkered in the corner, quiet as goose down. Granny Larocque she was small and had hands that could count your ribs even with your sweater on and fingers like talons, not long, but wicked skilled. She plucked Miss P right out, wrung her neck like a dishcloth, chopped the head clean off and nailed it with the milk bill to the door of Grandpa Frank’s shack, ripped her apron right in half, flung it on his front step, went back inside with her hair all in curlers made her look like some old-town Medusa. Her hands shook which they never did. Cob Brown snuck out the back of the shack, bottle sloshing inside his jacket, and us Larocque girls jumped into bed, tucked ourselfs in tight as two matches in a matchbox, red heads sticking out like lit-up tinder. Savannah Featerstone is a relative newcomer to the poetry scene but her words belie that. She writes with a understated confidence. I want to end this post with her words from the end of her poem – A Gradual Destruction: Shamans say/disease is the splintering, the fracturing/ of soul – retrieval possible, but difficult. Breaks/happen. We learn to live in the fissures/ of our own landscape. We learn to live with what remains. And in this anthology, many fissures, much beauty and so much remains. This entry was written by Richard Osler, posted on April 18, 2013 at 10:00 pm, filed under General and tagged Barbara Black, Cynthia Woodman Kerham, Linda Thompson, Lorna Crozier, Micheline Maylor, Patrick Lane, Planet Earth Poetry, Poems From Planet Earth, Savannah Featherstone, Yvonne Blomer. Bookmark the permalink. Follow any comments here with the RSS feed for this post. A lovely summation. This book needs to find its way out into the wide, wide world, and it will do that with people like you who read it and share particular passages that ring clear for them. Thanks for this post, and for your poem in the anthology. Dear Rhonda: Thank you! ANd for your work on this! ANd your poem in the anthology on the internet-dating Peresphone! I will manage to find a spot for it in an upcoming blog. Such surprises in your poems. Such creative edginess and humour! Thanks for this wonderful “taster menu” of poems! Richard! Thanks for “hosting” my whacky prose poem, and it’s in good company, too. I agree entirely with you that the anthology is masterfully edited, full of cracking good poetry (including yours) and beautifully typeset as well. 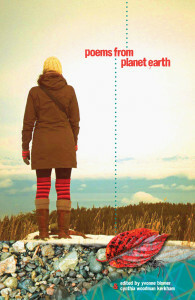 A great way to mark the success of the ongoing Planet Earth Poetry series. Cheers! BB. Barbara: Wonderfully whacky yet deceptive. Comedic yet heart-breaking! Thank you for letting me use the poem in my blog! The big thanks to you and Yvonne. I look forward to the reading in Nanaimo through Wordstorm!